• Small footprint on or below decks for installing pumping equipment • Intermittent service that requires quick, multiple starts with minimal line priming • Varied shipping media with differ- ing ? uid-handling characteristics • Effective stripping of cargo holds to maximize deliverable working vol- ume without any pump shutdown due to vapor locking • Strict cycle times regarding incom- ing and outgoing shipments, with delays or shutdowns affecting the shipper’s pro? tability • Risk of explosion due to static charge buildup during ? lling cycles. The design of screw pumps makes them capable of handling liquids with varying levels of viscosity, while today’s • No pre-heating of high-viscosity lengthens service life window of ? uid viscosities at higher screw pump models can offer ? ow rang- ? uids, which can be handled with- • Intrinsically smooth and quiet op- rates and pressures, lower energy con- es from 220 gpm (833 L/min) to 11,000 out sacri? cing performance eration sumption and no BEP to identify –make ? gpm (41,635 L/min). The screw pump’s • Constant ow, even in the presence • Extremely low pulsation reduces them an ef? cient and versatile alterna- operation sees opposed screws engaged of varying backpressures due to vis- stress and prolongs life of associ- tive to centrifugal pumps for shipbuild- to form a sealed cavity with the pump cosity changes ated ? uid-transfer components ers. Screw-pump technology advantages in maximize line-stripping while be- external bearings and a timing-gear trans- shipping applications include: ing able to tolerate the intake of en- mission, which produces double-suction, • Compact design that can be mount- trained air and other gases without self-priming operation with no metal-to- ed in a vertical or horizontal orien- vapor locking metal contact between the pump’s inter- About the Authors: tation with minimal deck support • High volumetric and overall operat- nal components. Triple screw pumps are Josh Pepper is the Global Product while providing a good power-to- ing ef? ciencies, resulting in reduced designed with a male drive spindle, two Manager – Screw Pumps for Blackmer, density ratio costs female secondary spindles and a case Grand Rapids, MI, USA, and can be • Can strip residual ? uids from the • High and constant ? ow rates even that contains the screws, which allows reached at (616) 248-9235 or josh.pep- cargo hull when experiencing upstream and the ? uid to move smoothly and continu- per@psgdover.com. Michael Moore is • Can handle a wide range of ? ows, downstream pressure ? 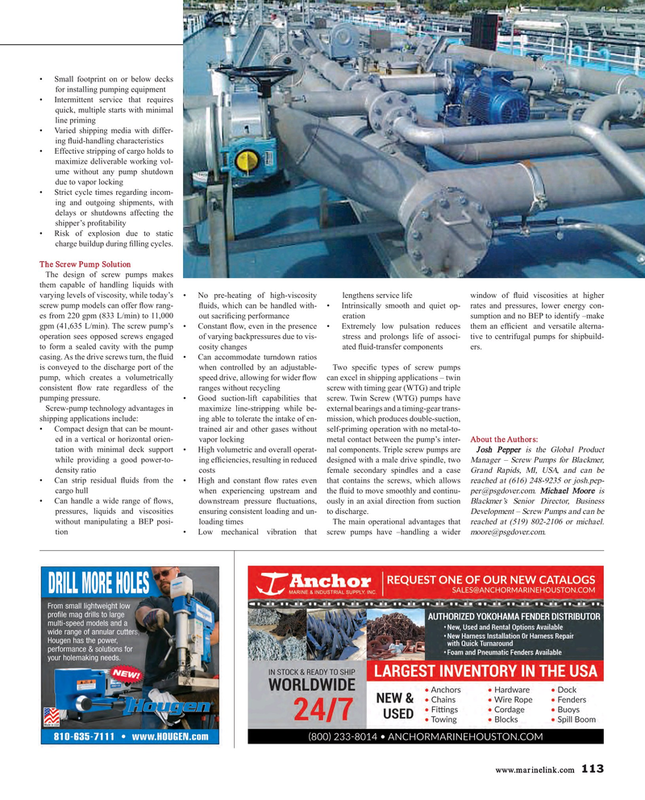 uctuations, ously in an axial direction from suction Blackmer’s Senior Director, Business pressures, liquids and viscosities ensuring consistent loading and un- to discharge. Development – Screw Pumps and can be without manipulating a BEP posi- loading times The main operational advantages that reached at (519) 802-2106 or michael.